UNITED NATIONS, November 9 -- In choosing Ban Ki-moon as Secretary-General, former U.S. Ambassador John Bolton told reporters on Friday, "we wanted someone who would wake up in the morning and not conclude that he was God's gift to humanity." While thus praising Mr. Ban's humility, Bolton went on to say that he has been "disappointed in the pace of reform, and that extent," although he was glad to see Ban accept a number of resignations. Inner City Press had used up its one question on the Ban and reform question; Bolton was not asked any follow-up about Mark Malloch Brown, now "back in the game" as a UK intermediate minister, or for his views on his successor, Zalmay Khalilzad. 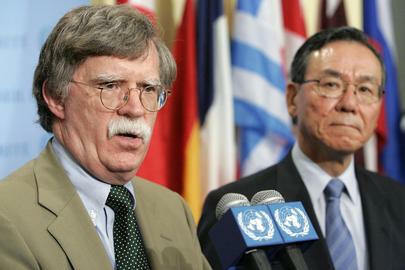 Bolton was at the UN to promote his new book, "Surrender Is Not an Option." (Inner City Press reviewed the book last week, click here for that.) He had a bodyguard with him, and a box of forty free books. Reporters' questions ranged from Israel's recently bombing of Syria (regarding which Israeli Ambassador Dan Gillerman this week in a stakeout interview covered here said, "What bombing?") through Iraq to Iran. After ridiculing the Annan administration's description of the Secretary General as the "secular pope," Bolton called the International Atomic Energy Agency's Mohamed ElBaradei a wanna-be "secular cardinal" who puts himself ahead of member states and is an apologist for Iran. He called the Palestinian Authority "broken" and said now is not the right time for the Bush administration's upcoming conference in Annapolis, since among other things Israel could not make commitment given its "internal political situation." On the politics of Ban's selection, Bolton writes of Japan's Ambassador, "I met with Oshima, urging him to reconsider Japan's 'discourage' vote on Ban, which he did not deny to me." Japan has since denied that it cast the interim discouraging vote. Inner City Press asked for Bolton's reply; eventually he said, "Let them write their own book." John Bolton and Japan's Ambassador Oshima: writing his own book? Asked bluntly if water-boarding is torture, Bolton responded that he does not give free legal opinions, especially on topics he has not studied up on. Asked about the perception of his and the Bush administration's unilateral style, Bolton first shot back, "I can't deal with perceptions, I'm not a shrink." Then he hearkened back to Richard Nixon unilaterally destroying the nation's stockpile of biological weapons. Sometimes unilateral is good, he said. On reform, Inner City Press asked if he thought enough has been and is being done to get the UN Board of Auditors access to North Korea, for an investigation that has been called for but has been blocked. This, Bolton did not answer. On this point, he again decried the "slow start to reforms," saying "that's not going to change." But what happened to "Surrender is not an option"?